The Las Vegas Strip, for all its appearance as the ultimate postmodern city, is actually a suburban landscape. Like suburbs elsewhere, over time the success of the automobile-friendly Strip drained energy away from downtown Las Vegas, so much so that many Americans fail to realize that the Strip is not the center of the city. Las Vegas leaders have worked for more than forty years to bolster their downtown. 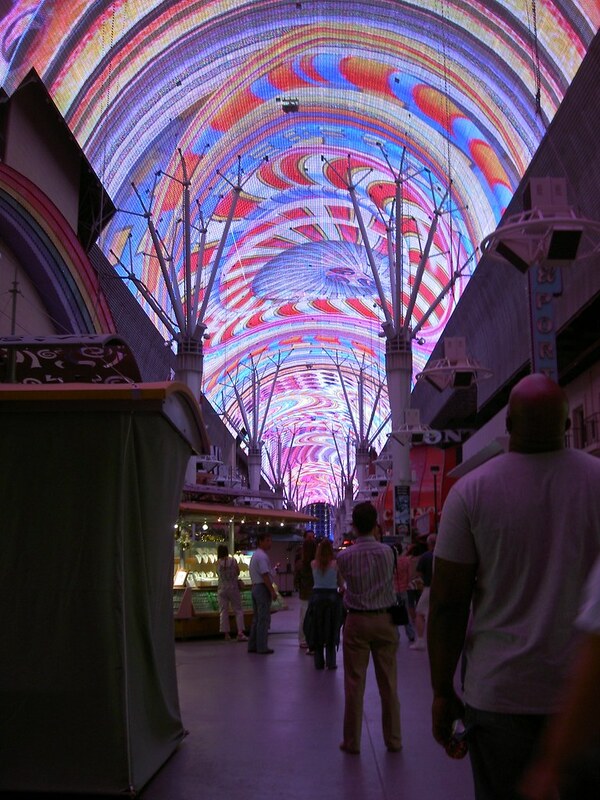 The original Glitter Gulch got a major boost in the 1990s when the barrel-vaulted, neon-canopied Fremont Street Experience transformed the city’s old main street into a futuristic pedestrian mall. But, as The Goddard Group Blog recently revealed, downtown almost got something much more monumental – a full-size replica of the Starship Enterprise from Star Trek! The conceptual paintings show a spacecraft as long as the Eiffel Tower is tall. The history of American tourism is dotted with examples of follies incorporated into place-making efforts to lend uniqueness. Ultimately Goddard incorporated the idea into Star Trek: The Experience, an attraction at the Las Vegas Hilton from 1998 to 2008. Had the Starship Enterprise landed downtown, it would have been yet another example of Las Vegas’s perennial reinvention and a powerful demonstration that tourist destinations that trade on their novelty must forever be on a mission to go where no attraction has gone before.